Rock drummers featured in new drum book | The Music Universe - Pop It Records - NEW MUSIC EVERYDAY! Noted author David Frangioni is releasing a new book entitled Crash: The World’s Greatest Drum Kits From Appice to Peart to Van Halen in which he’s celebrating on Tuesday, August 21st with a sit down Q&A in Los Angeles. Joining him will be KISS drummer Eric Singer and other special guests who will also sign copies of the book at the end of the night. Frangioni is a noted author, music businessman, producer, technologist and musician. He has written for Rolling Stone, Mix, and Robb Report. Frangioni is considered one of the world’s most prominent and knowledgeable collectors of drums, Clint Eastwood memorabilia and baseball cards with more than 10,000 items in his ever-growing collection. He is the founder of Frangioni Media and the Frangioni Foundation, a nonprofit dedicated to inspiring children through drums and music. Some say that drums are the heartbeat of music. 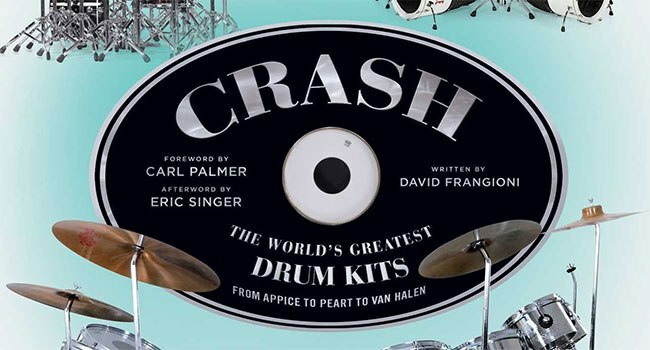 Crash is the heartbeat of drumming revealing the world of iconic drum kits and the famous drummers who played them. From snares to cymbals to booming bass drums, drums are taking over the stage in this first-ever collected look into some of the most famous drum kits of rock and roll history. Take a visual journey through the world of rock and jazz drumming, featuring commentary from drummer, collector, technologist and sound authority David Frangioni and camerawork from iconic rock photographer Mark Weiss. Including photographs of Neil Peart, Carl Palmer, Ginger Baker, Keith Moon, Ringo Starr, and many more, Crash is the ultimate photographic guide to the world of rock ’n’ roll’s most famous drum kits. The evening will also include a discussion about Frangioni’s other new book, Clint Eastwood: Icon. The book captures the powerful presence of Clint Eastwood the ultimate American hero beyond the screen. The event will be held at Mr. Musichead, located at 7420 Sunset Blvd, Los Angeles, CA 90046, from 6-10 pm.